thepiratebayKind of an arbitrary selection to close out the year – and the regular cover of the week thing as a whole – but hey, it’s timely. Dev Hynes doesn’t operate as Lightspeed Champion anymore, and even his new Blood Orange persona is presently taking a backseat to his role as Solange’s producer/co-conspirator, he was/is an amazingly prolific musician no matter what you call him, releasing music through whatever avenue happens to be convenient. In 2007, that was MySpace and even before his debut full-length as Lightspeed Champion Falling Off The Lavender Bridge came out, he was giving away music to his early-adopter fans, like the Garageband Xmas EP. As the name implies, it was an EP of holiday songs recorded with GarageBand and one of the selections was the 1980 ABBA single from Souper Trouper. It’s an odd cover of an odd single, but it’s how we’re going out. And while the EP’s not available via MySpace anymore – though apparently they’re trying to be a thing again in 2013 so good luck with that – you can hope this torrent still works. And with this the likely final post of year, I’d like to make note that the “worst retirement ever” will be getting a little less worst from here on out. I had said that I would ride 2012 out at pretty much the same pace I always had, but 2012 is over; expect things to get somewhat quieter hereabouts as, over these holidays, I’ve rediscovered how nice it is to not be writing a blog post every night/weekend. There’s actually a lot of hours in the day! In any case, have a safe New Year’s Eve, and I’ll see you in 2013 eventually. BBCThere’s no shame in being late to the party on certain artists; it’s simply not possible to keep up with everything that’s out there, let alone apply the necessary hype filters to discern what’s genuinely good and what’s just hip noise. I tend to go with the philosophy that if it’s worth hearing, I’ll hear it eventually and if it’s not, then I won’t even know what I missed. Of course, sometimes you realize it’s worth hearing a little too late. By the time the buzz around Amy Winehouse reached my ears back in 2007 or so, talk about her talent was already inextricable from tales of her offstage antics and addictions, so rather than potentially participate in the tabloid/gossip storm, I declined to even bother giving a listen and missed her one and only Toronto performance at The Mod Club in May of that year. Our paths would have crossed later that Summer as she was one of the big-name undercards for that year’s V Fest but her personal issues continued to grow to the point of having the pull out a couple of weeks before the festival date. There were the usual apologies and assurances that she’d make it up, but of course she didn’t. Amy Winehouse died earlier this Summer as a result of what appears to side-effects of attempting to detox at the age of 27. In the ensuing flood of tributes and remembrances, I finally took the trouble of giving her music a listen and yeah. Clearly I missed out. And clearly I’m going to be one of those adding to the posthumous sales of Back To Black. The title track of which was covered in stately style by Elbow for a BBC Live Lounge session in June 2008; Elbow are another artist I was slow on the uptake for, only getting on board fully sometime between Leaders Of The Free World and The Seldom Seen Kid, but am now completely won over. I’ve been waiting a long time for them to return to town for their own headlining show with me as a proper fan and they’ll finally do so this Wednesday night at The Sound Academy. And also offering an interpretation of “Back To Black” in 2008 was Dev Hynes, who at the time was still operating as Lightspeed Champion. I ignored his first band Test Icicles and justly so as they were terrible, but have been a fan of everything he’s done since. His stripped-down, acoustic rendering appeared on the NME Awards 2008 cover compilation which featured covers by artists who appeared on the NME Awards ceremony or sponsored tour that year. Hynes has since put the Lightspeed Champion monicker to bed and now records as Blood Orange, having released his debut Coastal Grooves back in August. He’ll be at The Garrison on October 21 supporting and also playing as part of CANT. Review of Elbow’s build a rocket boys! elbow.co.ukThe overarching storyline to Elbow’s career can generally be summed up as, “slow and steady wins the race”, with the race in question perhaps referring to the prestigious Mercury Music Prize, which they were nominated for in 2001 for their debut Asleep in The Back and finally won in 2008 for album number four, The Seldom Seen Kid. The adage could also apply to my own relationship with the band, which started with indifference to Asleep, complete ignorance to 2003’s Cast Of Thousands (though better late than never), respect with their third record Leaders Of The Free World (thankfully in time to see them live) and, in line with the Mercury jurors, something akin to love for The Seldom Seen Kid. All of which is to say that the Mancunians’ fifth album build a rocket boys! was the first of theirs that I had been awaiting with hand-rubbing glee and though it’s not quite what I had expected, it hasn’t disappointed one bit. To the point of it not being what I was expecting, it’s hard to articulate what I mean by that as I don’t really know what I was expecting. Another record with the grandeur of Kid was unlikely, but the overt leanness of rocket was still surprising. From start almost to finish, it keeps things low and tight, the songs often built around a single unwavering chord or bass note like a pulse that must be kept strong and steady. The drama that Elbow excel at still manifests itself in swells and blooms throughout, but it’s not until the final tracks “Open Arms” and “Dear Friends” that it feels like the record is allowed to really exhale. But despite the way things are constructed, tension is the last feeling that rocket evokes. Instead, it’s an almost preternaturally calm record – lead single “Neat Little Rows” is the only tune that you could consider a rocker – infused with a grace and sentimentality that’s distinctly Elbow. With orchestral and choral accents, it’s a recipe that from other bands’ kitchens might end up overly sappy but in Elbow’s masterful hands and delivered through Guy Garvey’s rough and yearning vocals, it deftly sidesteps melodrama pitfalls and is never anything less than gorgeous. For bystanders, the band’s Mercury win may have represented the culmination of a long career but clearly, for the band, it was just an affirmation that they were on the right track and people (like myself) were coming around. But they’re not done yet, not even close. Though released in the UK and Canada since last month, build a rocket boys! gets a physical US release this week. The band plays its first North American show since Summer 2009 at Coachella and all indications are that a proper tour will follow later this year. Paste has an interview with Guy Garvey and the band have just released a video for the new record’s second single. Also making a return to America at Coachella – though a much longer hiatus – is Suede. The extensive reissue program for their back catalog which starts at the end of May in the UK and runs through the end of June will apparently also be happening in the US, though firm release dates haven’t been announced. Here’s hoping that it also includes more North American dates – even if they are with Fat Richard and not Bernard. Filter is marking the band’s return with a series of features all week including a history of and an interview with former Suede guitarist and Elastica leader Justine Frischmann. More will follow this week, and here’s one of the remastered tracks from last year’s The Best Of compilation. NME reports that Bloc Party, their post-Intimacy hiatus apparently now at an end, will reconvene to work on a new record in September. Pitchfork solicits a guest list from Ian Parton of The Go! Team while frontwoman Ninja has a quick chat with aux.tv. Daytrotter serves up a session with Yuck, who also have a TunnelVision clip up at Pitchfork. They will be at The Phoenix on May 1. The release of Patrick Wolf’s new album Lupercalia has been pushed back a couple of weeks from May 31 to June 20 worldwide, with a North American release date to be announced. DIY has the official statement from Wolf on the delay and an interview that talks about other things (almost certainly conducted before the delay was announced). 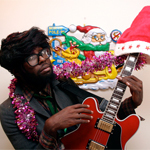 Spinner seems to have dug up an old interview with Dev Hynes of Lightspeed Champion, as it talks about last year’s Bye Bye EP and makes no mention of the fact that Hynes has shelved his Lightspeed Champion persona in favour of the funkier Blood Orange. That project’s debut release – the “Dinner”/”Bad Girls” 7″ – will be out on April 26 with a full-length to follow later this year. Originally slated to come out in March, NME reports that Emmy The Great’s second album Virtue will now be out on June 13. Noah & The Whale have put out a new video from Last Night On Earth. Interview speaks to Anna Calvi about the arm injury that forced the rescheduling of her North American debut dates. She will now be at The El Mocambo on May 27 and I hope that her inclusion on the just-released Osheaga lineup means there’ll be a return engagement come late July/early August. Another day, another PJ Harvey video from Let England Shake. The Fly reports that Johnny Marr has left The Cribs to devote more time to his solo project with The Healers and not reforming The Smiths. The Cribs have released a statement about the amicable parting of ways. The latest Brit buzz band Brother will be at The Horseshoe on May 3 for a free show. The Slough Observer has an interview with their native sons; Live 4 Ever also has a chat. Art Brut will bring their new record Brilliant! Tragic! to The Mod Club on June 17 as part of NXNE. The record is out May 23 and a second track from the album is available to download at Pledge Music. Gomez will follow up the June 6 release of Whatever’s On Your Mind with a date at The Phoenix on July 17; tickets $26 in advance. Though Guillemots frontman Fyfe Dangerfiend has done quite well for himself solo, he and his band have reconvened for a new record in Walk The River and it is streaming in whole right now at Hype Machine in advance of its release next week. The Independent has a feature piece. Wild Beasts have released a video from their new record Smother, due out May 10. Interview does its thing with James Allan of Glasvegas. Euphoric Heartbreak is out today. The Georgia Straight, Vancouver Sun and Montreal Gazette chat with Two Door Cinema Club. Devonté HynesWhen it comes to his art, Dev Hynes is no stranger to abruptly shifting gears. His first band, the sophomoric dance-punk band Test Icicles called it quits in early 2006 just when they were starting to achieve some success, and Hynes would resurface a year later as a solo act operating as Lightspeed Champion. It’s that project that brought Hynes to the attention of most, thanks to the wonderful country-tinged debut, Falling Off The Lavender Bridge. This year’s follow-up Life Is Sweet! Nice To Meet You didn’t quite measure up, feeling overburdened by its more orchestral aspirations, but was hardly a failure. And surely album number three would be better? Except there apparently won’t be an album three. Even before Life Is Sweet came out, Hynes began writing, recording and gigging under the guise of Blood Orange – it didn’t sound worlds removed from Lightspeed, but the one-man home recordings certainly pointed at it being an outlet for his funkier, more groove-oriented side. And according to this new interview at Interview, Hynes is putting Lightspeed Champion out to pasture and making Blood Orange his main creative outlet – a debut single will be out in January and a full-length will follow in the early part of next year, and that means the Van Dyke Parks-enhanced Bye Bye EP coming out on December 13 will be prophetically-titled. I will miss Lightspeed – Lavender Bridge remains a favourite from the past few years – and am especially sorry I wasn’t able to see him at the Horseshoe this past Summer, but if Blood Orange is what it – and he – is going to be, then I’ll be there. Oxford Student talk to Stornoway, who will be a the El Mocambo tonight and have just released another MP3 from their lovely Beachcomber’s Windowsill by way of enticement. BBC reports that Portishead are making plans for album number four and there are also rumours swirling that they’re intending to stage their first North American tour in forever next Fall. Fingers crossed. The Yorkshire Post talks to David Gedge of The Wedding Present, who apparently lost bassist Terry de Castro as a member sometime in the Summer. British Sea Power have released the first video from their forthcoming Valhalla Dancehall – out January 11 – and I can’t figure out if it’s playful, creepy, romantic or just plain weird. I am going to go with weird. NME reports that Editors think three studio albums are enough to justify releasing a box set, and will do just that in February of next year – Editors: The Complete Collection will consist of seven 12″ records (album-length or single is unclear) and seven CDs of b-sides, rarities and other Editors ephemera. Belle & Sebastian frontman Stuart Murdoch’s diaries circa The Life Pursuit and Dear Catastrophe Waitress have been collected in book form – The Celestial Cafe will be released in early 2011. MusicOmh talks to Duffy. Her new record Endlessly arrives December 7. The Vaccines, who are apparently set to be the next big thing out of the UK, will be riding the buzz through a free show at the Horseshoe on January 18. The Guardian and Von Pip Musical Express have profiles of the band, which should give you all the background you need to make like you’ve been a fan, like, forever when you’re jammed into the ‘Shoe with all the other Anglophiles in the city. Spinner chats with Kate Nash. Piper FergusonJust the briefest of posts today as I decamp for the east coast. If you want something more substantial, might I suggest a burrito. It’s been a while since Dallas’ Old 97s have been in heavy rotation hereabouts – or any kind of rotation, if I’m being honest – but there was a spell back around 2004 or so when hardly a day went by that I didn’t listen to either Fight Songs or Satellite Rides multiple times. So while I haven’t heard their new record The Grand Theatre Volume One, just released last week (Volume Two will follow next Spring), I am intrigued by the fact that rather than include Toronto on their full Winter itinerary, they are sending Rhett Miller and Murry Hammond to town for an intimate-type show that could well be cooler than the full band setup. The show takes place on November 10 at the El Mocambo, tickets are $17.50 and go on sale Friday. There’s interviews with Rhett Miller at The Houston Press, Dallas Observer and Spinner and yeah, I busted out Fight Songs while writing this up. Spinner talks to Ken Stringfellow of The Posies. Pixies are giving away a free live EP at their website. Go. Free. Spin and Limewire ask Liz Phair what she was thinking when making Funstyle, which was released with the Girlysound Tapes yesterday. You can hear the whole thing at Spinner and take home a track courtesy of Limewire. It’s… interesting. The Chicago Tribune and Philadelphia Weekly talk to Isobel Campbell, in town today for an in-store at Criminal Records at 6PM on her own and then a show at Lee’s Palace later tonight with Mark Lanegan. NME reports that Lightspeed Champion will release an EP of new material on December 13 entitled Bye Bye and that it’ll include a cover of The Beach Boys’ “Til I Die”, recorded with the aid of Beach Boys collaborator Van Dyke Parks. NPR is streaming the video of Jonsi’s show in Los Angeles this past weekend. Exclaim is streaming the whole of Diamond Rings’ debut Special Affections in advance of its release next Tuesday while Pitchfork has the latest single to download as well as a Guest List from John O. He plays The Garrison that same night. Chart talks to Murray Lightburn of The Dears. Godspeed You! Black Emperor have added a fourth – and presumably final – show to their Toronto residency next Spring. They’ll offer up one more show at Lee’s Palace the evening of April 24, following that afternoon’s dry all-ages performance. Tickets are $20 and on sale tomorrow, but you can expect that the freaks fans who bought up tickets for the other three shows in short order will be going after these as well, so hesitate at your peril.